The best way to control your Eventide H9. 37 people are registered for this product. Size : 187(l)x120(w)x40(h)mm. Power supply not included. One year warranty. Worldwide shipping. Q1-My EvenMidi H9 seems well setted but my Eventide H9 doesn't receive Midi messages. A : If you're connected in USB with H9 App, MIDI is disabled. If you're connected in Bluetooth with H9 App, activate "Midi over Bluetooth" in H9 App. Of course check that your Midi cable is well connected. A : When you're back from H9 App Midi can lag, just restart your Eventide H9. A : It's possible : Set the Live Mode bank limitation to "Full" for the EvenMidi. For your Eventide H9, assign Tap tempo to CC0 in Midi Control Change settings, enable Midi Output Clock and enable Midi Thru + Clock for output. EvenMidi H9 on PremierGuitar News feed. 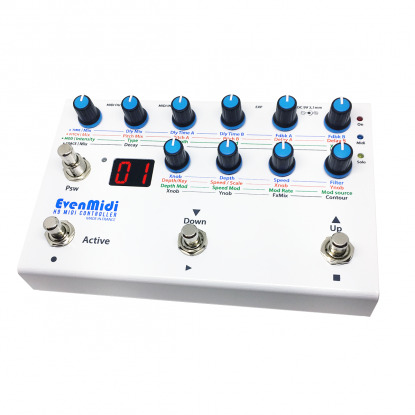 Control 1, 2, 3 or 4 Eventide H9 (or any Midi device) at the same time (Live Mode) or switch between devices (Solo Mode). You can set Midi channels for each Midi device. 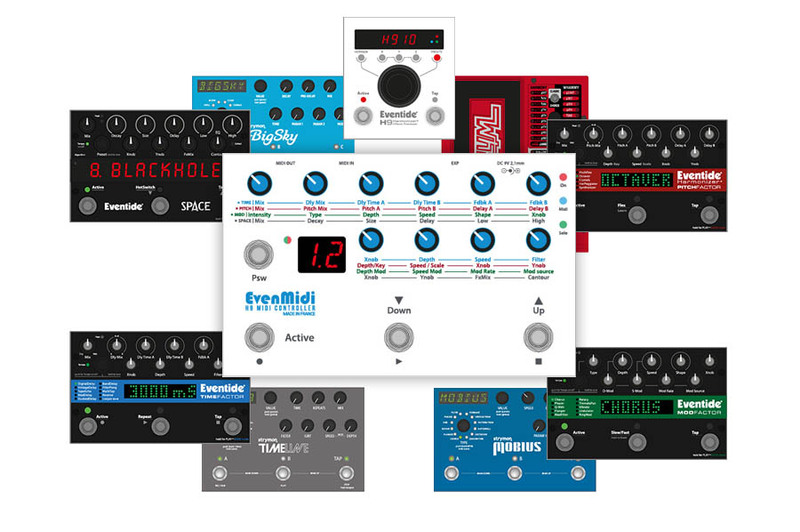 EvenMidi contain Eventide (H9 & Factors) and Strymon (Timeline-Mobius-BigSky) Midi Control Change stocked in memory and easy to call. EvenMidi H9 is oriented to work with Eventide H9 but not only, it's an universal MIDI controller. The configuration is extremely simple and takes less than 2 minutes. Follow the Quick Settings menu in the user manual to configure your devices. 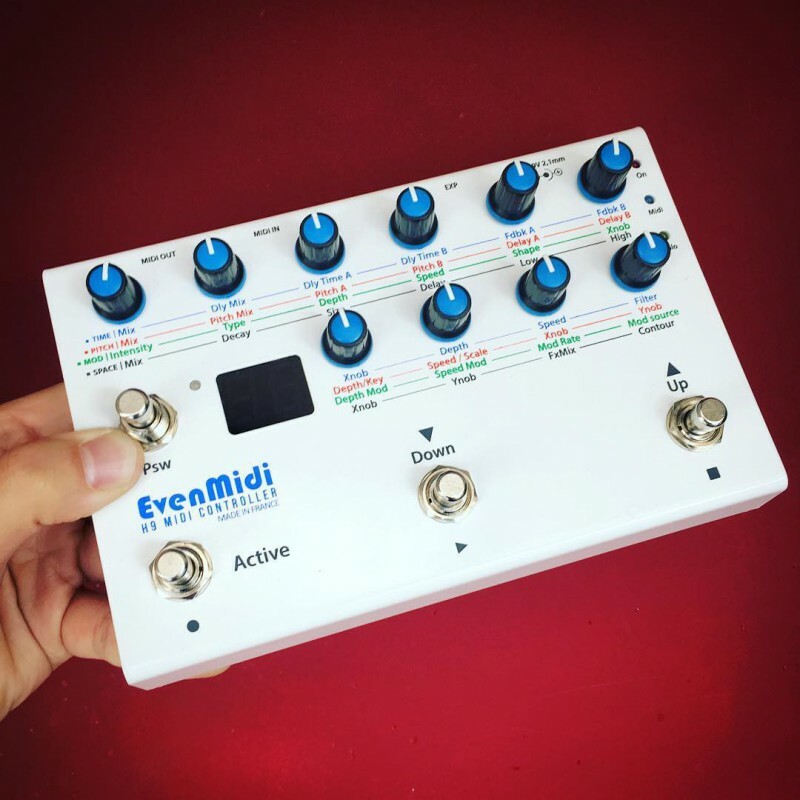 The EvenMidi is factory configured to work directly with an Eventide H9. 10 pots and 4 soft footswiches for a total control. Adjust and play with your tone live! No more time on your PC or iPad for tone edition. All parameters are under your eyes and you can play with it. Think about psychedelic delay auto-oscillation for example. In addition to guitarists, this controller is also very appreciate by musicians in electronic music : They love potentiometers! The Solo Mode can only control one device at time and you can switch between devices. Scroll through the presets, load them, activate PSW Performance footswitch to freeze a delay or change your rotary speed for example. If you use several Midi devices in Solo Mode, PSW footswitch allows you to switch devices. Very handy. Instant access to 27 presets (9 banks/3 presets) for a perfect Live experience. Limit the bank number as you need (1 to 9 banks). Access to 99 presets by scrolling as Solo Mode, PSW switch can be set to Tap tempo. Limit the preset number as you need (1 to 99). You can customize 4 generic devices as you need. Here is a full example. When you edit your Generic specifications, you can test it directly before storing in order to check your knobs and expression pedal work as you want. With Looper Mode, you can direct access/exit and control the whole looper like a factor stompbox and more. The Looper Preset is loaded automatically (press active footswitch 2sec) and you can control all Looper parameters as the TimeFactor pedal. You can switch from one device to another while your loop is playing. The Strymon timeline is already set to access looper. press Stop Footswitch 2sec to exit Looper Mode and back Solo Mode. 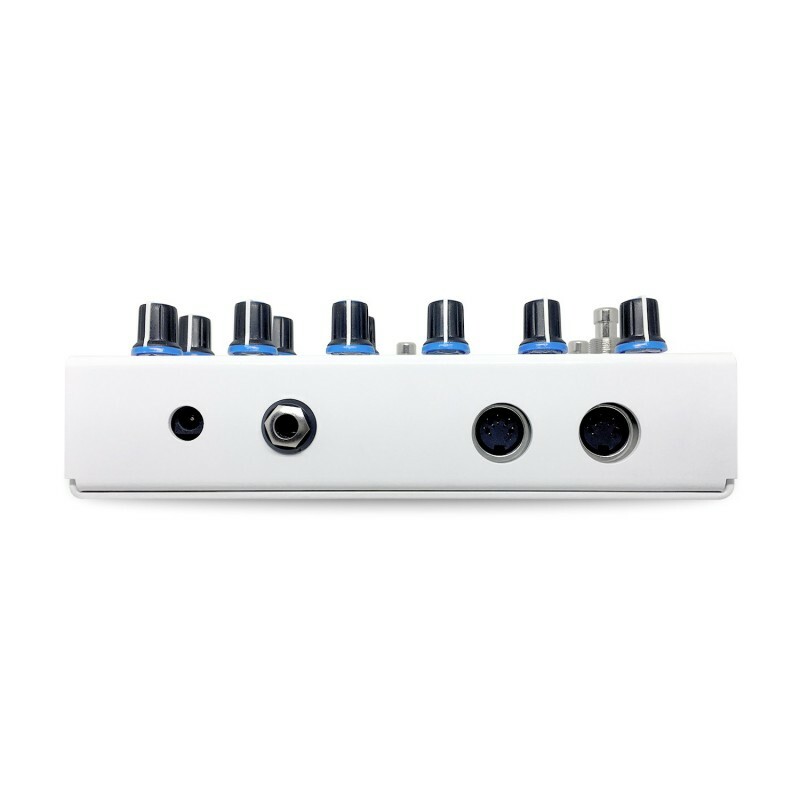 Plug an expression pedal to control a parameter with your foot. Volume, Wha, Pitch, Hotknob...Eventide are target to Pitchbend and Strymon to Control Change needed. You can calibrate your expression pedal in the settings. Scroll through your presets quickly by holding Up or Down footswitch. Put your potentiometers ON or OFF quickly by holding 2 sec. Up & Down footswitches. Very handy when you are on stage. Since Firmware v1.2 access to global settings menu by holding 2 sec. PSW & Down footswitches . Switch from Solo Mode to Live Mode by holding 2 sec. PSW & Active footswitches 2 sec. Switch from Solo Mode to Looper Mode by holding 2 sec. Active(Play) footswitch. Exit by Holding 2 sec. Up (Stop) footswitch. you can plug it in the EvenMidi because all Midi messages received (MIDI IN) are THRU (send to MIDI OUT) including Midi Clock. You can also control EvenMidi by sending PC and CC messages (to control Modes, presets...) on its specific Midi channel since 1.4 firmware. Exactly as described. Quick delivery. Great seller communication. Great controller and recommended to get more use out of your H9! Hi Franck, got the Evenmidi yesterday and it’s been great so far! You’ve done an excellent job intergrating it with the H9. Thanks for your hard work! I recommend this product to everyone who has at least one H9. It works just great, and it is able to control over four H9! Easy to set up and clear to understand. Franck, the seller is also a correct business man, his support after purchase is remarkable! Without doubt, this is one of the best purchases I’ve made. The unit controls my 4 Eventide H9’s perfectly. It’s is incredibly easy to setup, as a matter of fact, if you give Franck your H9 information he will preprogram the device so all you have to do is change your H9 MIDI channels to 1,2, 3 etc. Saving presets is really easy and you also have the benefit of all the on board tone controls. You can’t beat the cost of the unit. $199 US is a steal for any MIDI unit. I wanted to write to let you know how satisfied I am with the EvenMidi controller for my H9, it lets me get more use out of the H9 with its preset switching and knobs to tweak. I was about to buy another fancy effect pedal for myself, but decided on the EvenMidi so I could get more into the H9 max I already have; I am not disappointed. Thank you! Very nice controller, easy to set up and very well made. Feels solid. Merci pour le controller, c'est du bon travail! I think that this invention is super useful because you can see the pedal like a stompbox with many poxibilities added for your needs. I have done three live sessions without any problems, thank you again evenmidi!